Moving to a new country can be a daunting endeavor, especially moving away from your family and friends. Loneliness among international students, especially mature and graduate students is very under-discussed, however that doesn’t mean you should suffer alone. I’ve included a range of sites and tips for finding new friends, I hope you’ll find it useful! Honestly, I would be this bear’s friend. Your department study association can be a fantastic way to meet other student, with events ranging from guest lectures to after-lecture drinks. I found mine an excellent way to connect with fellow students, as well as finding friends to have coffee breaks with! You can find your department study association through your departments website. ISN host an international night every week on Wednesdays in Einstein’s, and also have a variety of additional clubs such as Movie club, Arts & crafts, and theatre. These can be a really good way to find other students with similar interests, as well as finding new hobbies. Having a hobby in common is an excellent conversation starter, with clubs and teams providing a good way to meet new people. Clubs such as the ones ISN host are a really good starting point and sites such as Meetup have a group to suit every hobby! Whatever you want companions for, there’ll be something on there for you. Expat groups can also provide a really good way to meet new people, though don’t be afraid of joining Dutch groups- your Dutch will improve much faster and the group is less likely to disband over summer. An increasing number of “dating” apps are introducing finding friend options. Bumble and OKCupid both have options to look for friends, and whilst there can be a stigma against finding friends online, it can be an incredibly useful tool. Organisations such as Couchsurfing also hold regular meetups, which are especially useful if you’re looking to travel the Netherlands or looking for somewhere to live. If you find the idea of getting out and meeting new people intimidating it can be useful to have one person you know there to act as a friend “wingman”. If you become increasingly anxious about social situations I would recommend speaking to a trusted friend or doctor, as there is help available should you want it. Group living can also be a really good fix for loneliness, and it’s worth considering this when finding a house! 1)- Find situations where you feel confident or happy- Whether this is playing a sport you enjoy, or a club for your favourite new hobby! 2)- Don’t be afraid to ask for help- Everyone gets nervous about meeting new people, speak to people you know about it and I’m sure you’ll find you’re not the only one. 3)- Put yourself out there- If you have the confidence, go to events or clubs you’ve not been to before, you’ll meet new people and have exciting new experiences! Good luck and let me know your tips in the comments! 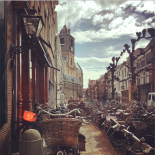 This entry was posted on March 11, 2018 by Sophie Jorgensen-Rideout in Living in Holland, Practical Stuff and tagged advice, friends, Friendship, hobbies, ISN Leiden, isolation, loneliness, relationships, Socialising.